FLETCHER, N.C., Oct. 30, 2018 (GLOBE NEWSWIRE) -- AuctionDeals, a marketplace of Liquidity Services, today announces the sale of a vintage Intorex TXA-1200, a specialty baseball bat manufacturing machine from The Young Bat Company, based in Fletcher, NC. The Young Bat Company has manufactured custom bats for several Major League Baseball players, many of which were produced on the Intorex TXA-1200 that is for sale. The Intorex is a woodturning copy lathe manufactured in 1996 and includes a hopper feed. The lathe can cut using either automatic or manual settings. Several of the hydraulic hoses have been replaced, along with several other adjustments made to ensure the machine cuts well and runs smoothly. Interested bidders for the Intorex TXA-1200 can view the auction at AuctionDeals.com. The Young Bat Company makes adult and youth custom baseball bats, along with other bat novelty items like mugs, keychains, bottle openers and more. The Company was run from 1993 to 2005 by Chris Young in Brevard, NC. During this time the company manufactured bats for many Major League Baseball players. Chipper Jones, Javier Lopez, and Andruw Jones, all of whom played for the Atlanta Braves, used Young-made bats in their professional careers. The company was recently reopened in Fletcher by Chris’s son Tom Young, along with his friend and partner Cody Siniard. 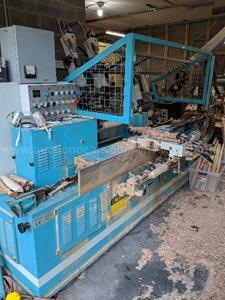 If you would like to place a bid on the woodworking lathe, you must be a registered bidder on AuctionDeals.com. Bidder registration is easy and free and can be completed on the AuctionDeals bidder registration page. A photo accompanying this announcement is available at http://www.globenewswire.com/NewsRoom/AttachmentNg/1261526b-ff78-43b0-9634-26f12b75c8cf.